Airship 27 Productions is pleased to announce the release of its first title of 2016; a gripping crime thriller by two of the finest new pulp writers in the business, R.A. Jones and Michael Vance. 1935 Detroit, the city is in the midst of a heat wave when a beautiful white woman is brutally raped and murdered setting off a powder keg. The chief suspect is a recently paroled black man. Fearing for his life, he goes into hiding only to discover that the victim’s father, a rich financier, has put a bounty on his head; one million dollars for his the apprehension; dead or alive. Standing between the fugitive and a lynching mob are detectives Michael Yellowstone, an Osage Indian and his partner, Lt. Jack Hill. Yellowstone is determined to find King and bring him in alive. What he does know is that Hill has a totally different goal in mind. Mexican artist Jesus Hernandez Rodriguez provides both the cover and black and white interior illustrations for this gripping novel with Award Winning artist Rob Davis providing the book design. 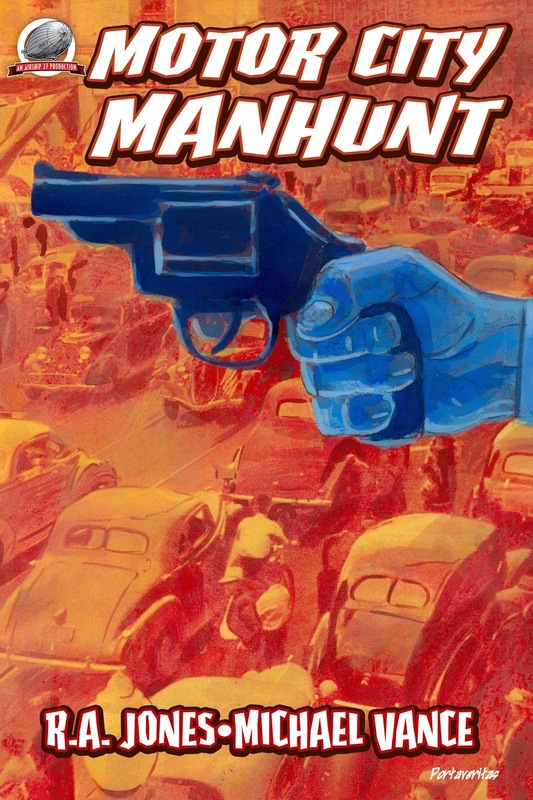 Michael Vance and R.A. Jones offer up a tense, suspenseful thriller that explodes across the pages and money hungry citizens are transformed into blood thirsty hunters in the biggest manhunt of them all.